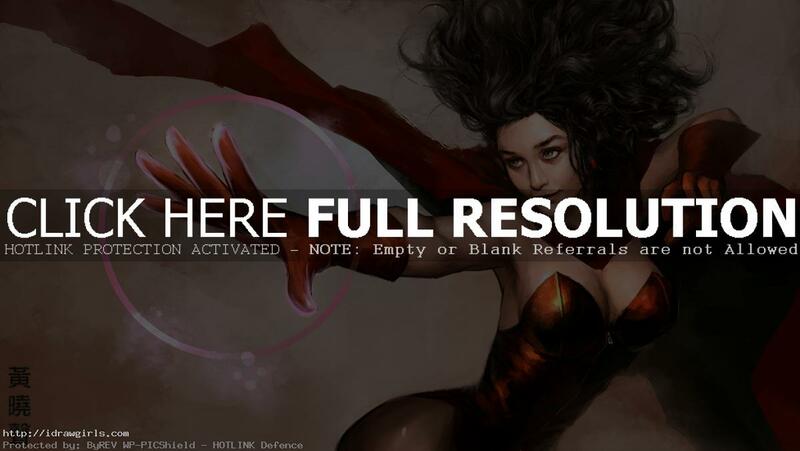 Scarlet Witch digital painting tutorial part 3, color and edges. Learn to draw and paint Scarlet Witch from The Avenger. In this video, you will learn how to add color, manipulate edges and finish an illustration. You will learn basic technique on how to get correct color using adjustment layer before you start painting. You can scroll down further to see step by step images with instruction. In this tutorial, I am painting Scarlet Witch or Wanda Maximoff. She is a fictional comic book character that appears in books published by Marvel Comics. Here is the final image of Scarlet Witch. It is almost done, I have to refine it just a little bit more in final version. This is the alternate costume without the headdress. I actually prefer this one to the other. Learn how to draw and paint both traditional and digital with FREE video tutorials and step by step images from profession concept artist Xia Taptara. Heya Xia! awesome tutorial as always! If you don’t mind、I have one question though…In most of your videos, you mentioned that we should start blocking with only 2-3 values right? I have a bit of a problem controlling my values (without reference), so I would like to know: as a guideline,how many percent values should we use? Like, 40% and 80% black?